The Acer Revo 100 PC has been launched, billed as a "sleek contemporary design with powerful multimedia capabilities." Boasting an AMD Athlon II Neo dual-core processor and feature the Acer clear.fi application that allows easy media sharing, this is a computer built for the living room and not the office. 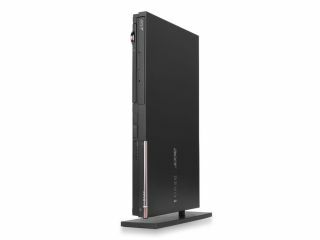 "Slim and elegant, the Acer Revo 100 is graced by a contemporary design and matte black finish, the Acer Revo 100 may be used on its removable vertical stand or be placed horizontally in a Consumer Electronic appliance tradition," stated Acer. "Nicely concealed within its lean body is the innovative RevoPad, a dual-mode wireless touchpad. Press the toggle button to transform the RevoPad into a touch keyboard to easily type any amount of text with your fingers," the company added. The Acer Revo 100 also boasts Nvidia Ion graphics, an internal TV tuner and can come with either a DVD or a Blu-ray player (for mo' monty of course). The computer supports up to 4GB of DDR3, and storage up to 750GB, and had Windows Home Premium. The basic model starts at £599.99 and, guess what, prices increase as you up the specs.